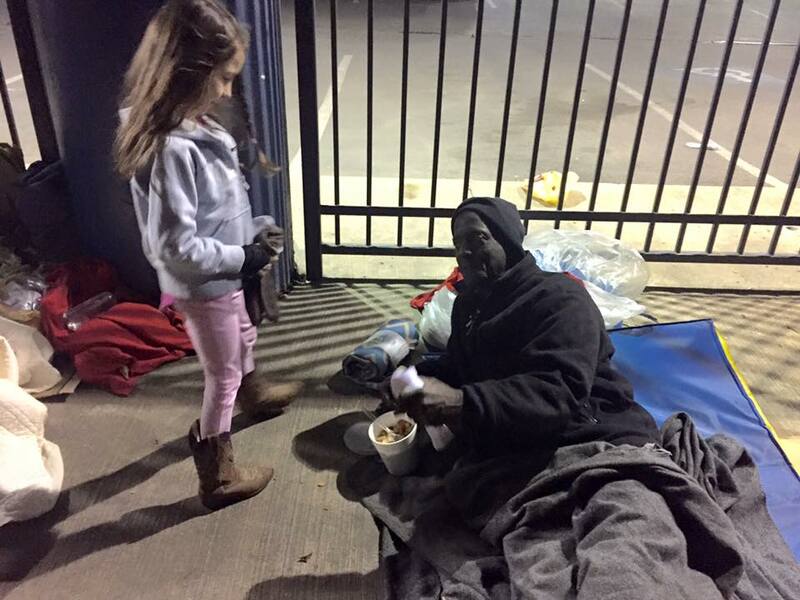 Developing relationships with homeless people under a bridge. Taking groups of homeless to the YMCA so they could shower. Taking groups of homeless to church every Sunday. Taking groups of homeless out to listen to live music. Networking with Christian rehab centers when homeless are ready to get sober. Networking with people on getting the homeless ID cards so they can be admitted into detox. Providing a Christmas present of 3 nights at a hotel (a donation from someone at his church). Matt started his ministry at the end of last year also, and he has been a very busy guy. We became fast friends. I asked if I could come along with him under his bridge in Katy, and he said of course. I didn't quite know what to expect. I certainly did not think we would be underneath such a busy bridge. It was along I-10 on the feeder, and it was pitch dark. I noticed that Matt did not turn on his flashlight, so I left mine off as well. The guys slept at the top of the bridge embankment and the "thok thok noise" of the cars was directly overhead. I was introduced to Joe and Ramone. Joe was an older gentleman with a tanned, weathered face from years of being out in the sun. He had been homeless for many years. Ramone was young, muscular and good looking. I was invited to sit on the edge of one of Joe's mattress, but I decided not to. For some reason I felt like I was invading his personal space. I sat quietly and listened as Matt bantered back and forth with the guys. It was clear that there were some very real relationships here. Joe was the first guy that Matt spoke to when he started his ministry, so the relationship runs very deep. Joe is still an alcoholic, but has made the decision to enter detox. He is waiting for a copy of his birth certificate to arrive (3-4 weeks). Matt began by talking to Ramone about his background. Ramone is an army veteran who fought in Iraq. He suffers from chronic post-traumatic stress syndrome. At 21 years old, he appears to struggle with the same things many young men do. His family situation is bad. He has a temper. He has demons. He has a past. Reminds me of me, except for the family part (love ya Mom!). Ramone mentioned that he had to break up with his girlfriend, it just wasn't working out. Matt had been reading the Book of Job to the guys. Joe piped in, "Story of my life man! I can't believe they printed it in a book. Story of my life!" I smiled at their enthusiasm. Ramone talked about his family. His mother's words of rejection were etched on him. Matt was skillful at asking follow up questions. "What do you think happened there? Why do you think that is?" At some point, Joe entered the conversation, "church people are hypocrites!" I calmly agreed. I explained that I am also a hypocrite from time to time. "That's why you can't base your faith on a person, but you must only base it on Jesus Christ." It was at this time, that the dark and dangerous bridge began to take on a cathedral feel to me. I look up at the vaulted archways and wide open space. I breathed in the cold fresh air. I felt chills up and down my spine. At that moment, I knew it...God was in that place. Matt read from a great passage in 'Purpose Driven Life' about your life's mission. Ramone's comments became increasingly those of confusion. He kept saying, "I don't know why I haven't accepted God. I don't know what's getting in the way. I have to do better. I have to get to a better place. I have to start going to church more." Ramone said that lately he has felt like God is punishing him for his bad decisions and rewarding him for his good ones. I moved over to Ramone's mattress with Matt. I told Ramone, "I think you are being pursued by the Holy Spirit. I wouldn't be surprised if it gets even more intense. Just remember whatever God wants to happen will happen, it's just a matter of how hard he has to smack you around to make it happen." Ramone stared at me thoughtfully. I tried again, "When you accept God into your life, it won't be anything you do. It will be an act of surrender. One day you will accept the Lord into your life, and when that happens I want you to remember the fat guy under the bridge told you that you wouldn't do anything..."
Ramone and Matt chuckled. By this time, Matt was visibly excited. He was interjecting with all sorts of important Godly wisdom which I can't recount, because my adrenaline was pumping through my ears. "Ramone, most people think that their life is a VCR. They believe they can rewind, and relive their mistakes over and over again, but that's just in your head. What you did is in the past, and nothing you have done was so bad that God won't forgive you. Trust me, He has seen it all...So my question for you is, what is keeping you from accepting the Lord into your life right now?" Matt stood up and said, "Come on Ramone, let's do it." Ramone remained quiet. He was thinking still. We sat silent for a few minutes. Matt said, "Listen Ramone, I can't do it for you. This is between you and God." Matt asked Ramone, can we pray for you? We prayed for several minutes. I asked God to send his Holy Spirit down so that Ramone could actually feel God's prescence. We sat silently again. Ramone said, "But there have been guys before who have come under the bridge from other churches. They are here for a few days, then they never come back." "Ramone, you don't have to trust either of us to do this", I countered. "What do I do? ", he asked quietly. "No tricks. No magic. Just repent of your sins, and ask God to come into your life." Ramone began to pray...an astounding, heartfelt, bone-jarring prayer that went on for 10 minutes. It was as if the words were sent from heaven. He said that the reason he was accepting God was that he knew he would never be alone, never be rejected again. When it was over, Matt and I could not contain our excitement. I ran to my car to retrieve a bible for him. Ramone told us that he could feel God, and he felt...clean. Ramone told us that three days prior, he was having thoughts of suicide. He was under the bridge and he cried out to the Lord...God heard his cries. This is a phenomenal story, Jeremy. God is so able to do more than we can imagine. Great writing too. Wow!! I met Joe tonight. What a challenge. And met Matt...what a blessing. His obedience and heart are inspiring. Sat for about and hour and a half under the infamous bridge with Jeremy, Matt and Joe, watching Joe down the booze and instigate an argument with Matt...the man who passionately wants to help him. The serious downside of addiction. Will continue to pray for the work Matt is doing there...and that God, in only a way He can, will reach down and get a hold of Joe's heart. Thanks Jeremy for taking me along.